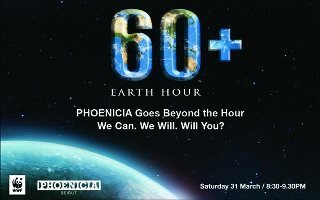 Earth Hour: What will you do, huh? Switching off one light, in one room, in one house, may seem insignificant. But doing so en masse for one hour at Earth Hour shows that when countless people switch off many lights, in many rooms, in many houses, the impact is considerable. If this action were carried out on a regular basis, and even became a habit and way of life, the impact could be extraordinary. It could grow further if started at a young age and taught at home and part of school education. Growing up, I was taught never to leave lights on in an empty room, not to squander water or food. Most waste was recycled in the garden compost heap. But at the time it was for financial reasons. This makes me think that affluence is at times a big source of waste. 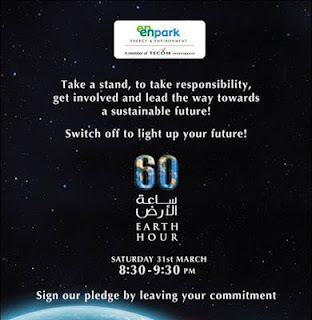 Earth Hour is a global initiative in partnership with World Wildlife Fund (WWF). Individuals, businesses, governments and communities are invited to turn out their lights for one hour on the last Saturday in March – the 31st this year -- to show their support for environmentally sustainable action. Started in one city in 2007, Earth Hour is now a global phenomenon reaching out to at least 1.8 billion people worldwide. The WWF’s Earth Hour is the world’s largest grassroots environmental movement towards action on climate change. Every year, Earth Hour, both globally and in the UAE, grows bigger. It brings together people to celebrate the planet that unites us, and to call for change that goes beyond the hour. Last year, Earth Hour saw hundreds of millions of people across 135 countries switch their lights off for an hour. It also marked the start of something new -- Going Beyond The Hour -- to commit to lasting action on climate change. This year Earth Hour has launched the challenge “I Will If You Will” on YouTube to showcase how everyone has the power to change the world we live in, bringing together the world’s biggest social video platform with the world’s largest action for the environment. It’s simple. You go to YouTube to record what you are willing to do to save the planet or accept one of the challenges already received. In the Emirates, the campaign is being led by EWS-WWF -- the Emirates Wildlife Society (EWS) in cooperation with the World Wildlife Fund (WWF). EWS was founded in 2001 in association with the WWF to work with people and institutions within the UAE and the region to conserve biodiversity and promote sustainable living through education and conservation initiatives. EWS is a non-governmental organization. 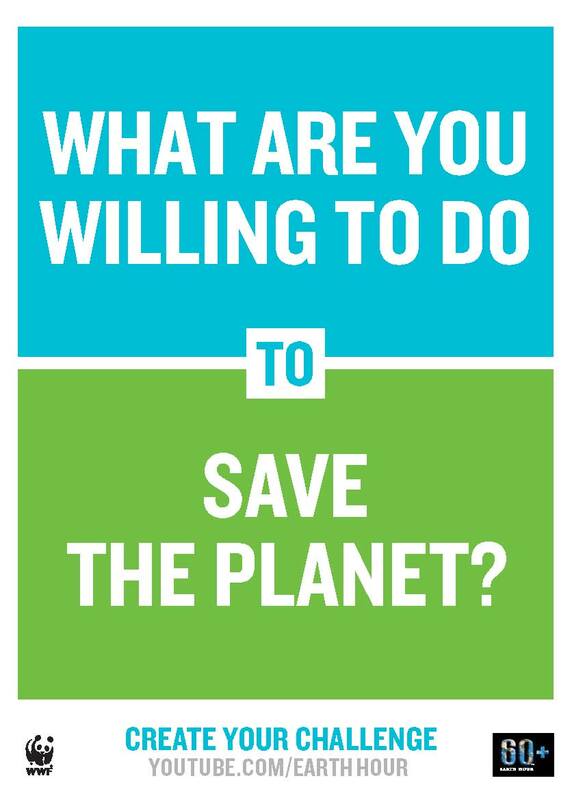 Its mandate covers species, habitats, climate change, ecological footprint and natural resources. Unfortunately, each year Earth Hour takes place on the same night as the Dubai World Cup, the richest horserace in the world, held at the Meydan Grandstand and Racecourse. And although non-essential lights are switched off between 8.30-9.30 p.m., the show goes on. In 2007, WWF-Australia inspired Sydney-siders to show their support for climate change action in the first ever Earth Hour event. It showed that everyone has the power to change the world they live in. In Sydney, 2.2 million individuals and more than 2,000 businesses turned their lights out for one hour to take a stand against climate change. In 2008, the plan was to take Earth Hour to the rest of Australia. But then the City of Toronto, Canada, signed up and it wasn’t long before 35 countries and almost 400 cities and towns were part of the event. The invitation to “switch off” is now extended to everyone. It is scheduled on the last Saturday of every March to closely coincide with the equinox to ensure most cities are in darkness as it rolls out around the Earth. Earth Hour’s 2012 campaign, “I Will If You Will,” digital platform was created by global ad agency Leo Burnett in collaboration with YouTube. It brings together the world’s biggest social video platform with the world’s largest action for the environment. 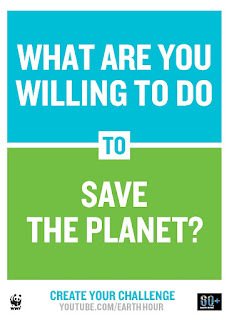 The “I Will If You Will” campaign uses the YouTube video platform to empower people to share a personal dare with the world by asking, “What are you willing to do to save the planet?” It gives individuals the opportunity to inspire their friends, colleagues and neighbors to take sustainability actions not just on the hour but beyond the hour, and hopefully throughout the year. The simple promise can range from recycling, to switching to energy efficient light bulbs, turning off the mobile charger, or signing up for paperless banking. Many of my friends are taking part in the “I Will if You Will” challenge, among them: OmnicomMediaGroup MENA social media manager Nagham Akileh; publicist, columnist for @readmeae, musician, gamer and co-founder of @pazmarketing Joe Akkawi; social brand builder, digital architect, playful entrepreneur and avid gamer Jad Hindy; artist and award-winning filmmaker Ashraf Ghori; and Alexandra Tohme, who covers strategy and business in the Middle East covering digital, retail, startups, futurism, mobile and more. Joe’s challenge is that if 300 people pledge to stop printing emails, he will shave his head in the shape of planet earth. Nagham and Jad want us to switch to energy efficient bulbs. 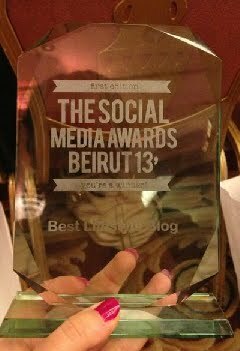 Nagham will pretend she is 14 and blog that way while Jad will plant 10 trees in his garden. Ashraf will make an Earth Hour commemorative painting if we started recycling, and that is worth having. For her challenge, Alex will give up the internet for a whole week if 500 people pledge to re-use plastic containers. And if 1,000 people agree to do the same, she will donate $1,000 to Feline Friends! In the UAE, participation in Earth Hour began in 2009 and the popularity of the campaign has increased year on year so that landmark after landmark across the emirates switched off lights and residential areas plunged into darkness for Earth Hour. In 2011, all seven emirates saw official participation from key landmarks including; Sheikh Zayed Mosque, Burj Khalifa, Al Qasba and Fujairah Fort. I also noticed a couple of earlier this week Earth Hour advertising panels going up on Jumeirah Beach Road as part of the campaign. Earth Hour has done much to raise awareness of sustainability issues. But there’s more to it than switching off lights for one hour once a year. It’s all about giving people a voice and working together to create a better future. It’s also about educating children at home and at school about environmental issues and making it a way of life for them. Another excellent initiative this year is the Fun Stuff section on Earth Hour’s site. 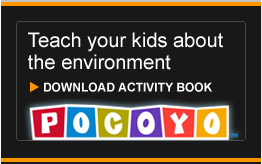 It’s something parents and schools can participate in with their children. 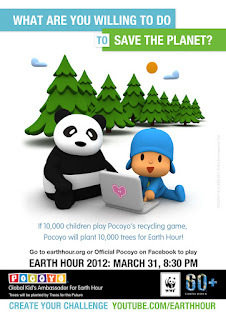 For example, there is a Pocoyo Earth Hour recycling game. 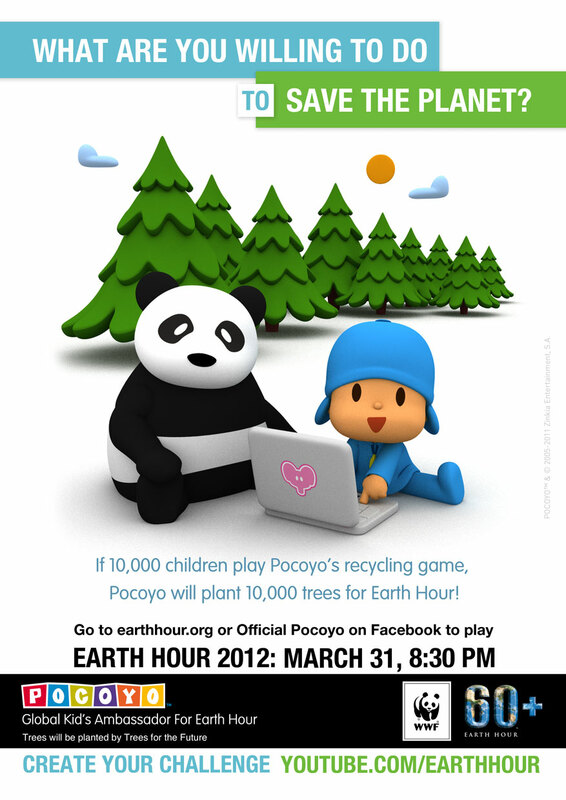 If 10,000 people play the recycling game, Pocoyo will plant 10,000 trees. It’s a great way to get involved and teach kids about recycling. Today is International World Water Day to focus attention on the importance of freshwater and to campaign for the sustainable management of freshwater resources. An international day to celebrate freshwater was recommended at the 1992 United Nations Conference on Environment and Development (UNCED). The UN General Assembly responded by designating March 22, 1993 as the ﬁrst World Water Day. 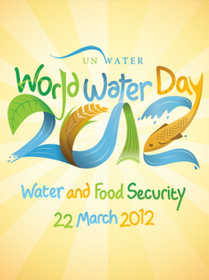 World Water Day 2012, under the theme “Water and Food Security,” is coordinated by the UN’s Food and Agriculture Organization (FAO). I identify with World Water Day because I spent more than 10 years, during the Lebanon civil war, living with very little water. The “waste not, want not,” motto taught at home long before that, stood me in good measure then. We were brought up not to waste water, electricity and food, not for environmental reasons at the time, rather to save on bills. When you have to use water, whether for bathing, washing, toilet flushing, cooking, cleaning etc… from a single bottle, you learn how to save. And this habit remains. I still don’t take a shower without appreciating running water. “Water and Food Security,” are intrinsically related as there are seven billion people to feed on the planet today and another two billion are expected to join by 2050. If only at one drop per person, that’s seven billion drops! FAO statistics show that each of us drinks from two to four liters of water every day. However, most of the water we “drink” is embedded in the food we eat. Producing one kilo of beef for example consumes 15,000 liters of water while one kilo of wheat “drinks up” 1,500 liters. 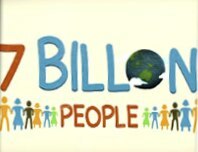 When a billion people in the world already live in chronic hunger and water resources are under pressure we cannot pretend the problem is “elsewhere.” Coping with population growth and ensuring access to nutritious food to everyone call for a series of actions. reducing the scandalous food wastage: 30% of the food produced worldwide is never eaten and the water used to produce it is definitively lost! producing more better quality food with less water. At all steps of the supply chain, from producers to consumers, actions can be taken to save water and ensure food for all. FAO says it takes 2,000 to 5,000 liters of water to produce one person’s daily food intake. The world is thirsty because of our food needs. To be able to feed everybody, we need to secure water in sufficient quantity and adequate quality. We also need to produce more food using less water, reduce food wastage and losses, and move towards more sustainable diets. Food security exists when all people, at all times, have both physical and economic access to su­fficient, safe and nutritious food that meets their dietary requirements for an active and healthy life. People who have better access to water tend to have better nourishment levels. Lack of water can be a major cause of famine and malnutrition, particularly in areas where people depend on local agriculture for food and income. The UN General Assembly declared access to clean drinking water and sanitation as a human right on July 28, 2010. Access to safe and su­fficient water is a human right under international law, and under some national constitutions. Water scarcity affects every continent and more than 40 percent of the people on our planet. By 2025, 1.8 billion people will be living in countries or regions with absolute water scarcity, and two-thirds of the world’s population could be living under water-stressed conditions. The lack of water limits farmers’ ability to produce enough food to eat or earn a living. South Asia, East Asia and the Middle East for example are already close to their resources limits, and their population is still growing. FAO adds that the gender gap in developing countries also plays a role as 43 percent of the farmers are women. But they are usually unable to perform well because of unequal access to services and resource inputs -- including water. If women had the same access to resources as men, they could increase yields on their farms by 20-30 percent. Closing this gender gap would lift 150 million people out of hunger. Developing countries and emerging economies currently face a nutrition paradox with, on the one hand, high rates of undernourishment -- over 800 million hungry people worldwide -- and, on the other, about the same number who are overweight. Both undernourishment and obesity can lead to the risk of debilitating chronic diseases. Sustainable diets are diets with low environmental impacts, which contribute to food and nutritional security and to a healthy life for present and future generations. Cutting food waste can feed the world. Roughly one third of the food produced in the world for human consumption every year -- approximately 1.3 billion tons -- gets lost or wasted, according to an FAO-commissioned study. Industrialized and developing countries dissipate roughly the same quantities of food -- respectively 670 and 630 million tons. Every year, consumers in rich countries waste almost as much food (222 million tons) as the entire net food production of sub-Saharan Africa (230 million tons). The amount of food lost or wasted every year is equivalent to more than half of the world's annual cereals crop (2.3 billion tons in 2009/2010). Consumers in rich countries are generally encouraged to buy more food than they need, the study notes. "Buy three, pay for two" promotions are one example, while the oversized ready-to-eat meals produced by the food industry are another. Consumers fail to plan their food purchases properly, the report found. That means they often throw food away when "best-before" dates expire. Education in schools and political initiatives are possible starting points to changing consumer attitudes, the report suggests. Rich-country consumers should be taught that throwing food away needlessly is unacceptable. They should also be made aware that given the limited availability of natural resources it is more effective to reduce food losses than increase food production in order to feed a growing world population. It takes me back to “waste not, want not…” This education should start at home. Let’s try and save a drop a day and be careful about the food we buy and the food we throw away. On this second day of Spring, let’s help Mother Nature help us. Twenty odd years since my mom Vicky passed away, Mother’s Day isn’t getting easier. Mother, Mom, Mommy, Omm, Maman, Madre… remain for me the most beautiful words in any dictionary and language. A mother is the most precious of beings and is to be celebrated and thanked every day of the year. And it is no wonder that Mother’s Day in the Middle East falls on the same day as the beginning of Spring. There are so many mothers to celebrate, especially those who have been losing their children in these troubled months. But it is one mother in particular I wish to mention on this first day of Spring – a mother in nature. She is hard working, entrepreneurial, loving and caring. I spotted her home before getting to see her around two weeks ago. I got interested to catch a glimpse of who lived there. Indeed, she had built her nest overnight at the top of a four-meter heavy-duty ladder. She is a Laughing Dove, also called a Senegal Dove, a very common pigeon in the UAE. Much smaller than normal ones, the Laughing Dove gets its name from its characteristic calls. Their soft, drawn-out calls sound like human laughter -- ha ha hoo hoo hoo hoo hoo. The dove’s home is built of sticks and it took just one day to complete, in time to start her family. On the second day I spotted one white egg in the nest. On the third day there were two. The species is known to lay two white eggs. Since then, and for 10 days, Mother Dove has been sitting on her eggs, nearly 24 hours a day. She must leave the nest at some point to feed herself, maybe in the early mornings, but I haven’t witnessed this. I cannot help but admire the dove’s love and devotion. She sets a good example. I look forward to seeing her offspring and watching them grow and fly the nest. I often wondered if the turmoil sweeping our region for the past 14 months can rightly be dubbed an “Arab Spring.” In places, it is more of an “Arab nightmare” begun in winter and still trying to shake off the snow. But when a Nobel Peace Prize laureate and one of Iran’s leading lawyers and human rights activists doesn’t agree with the term, it is worth reading. 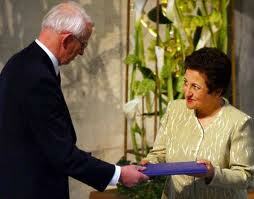 I cannot agree more and strongly recommend reading Ms Ebadi's article in full here. Easter, just a month away, is my favorite holy day of the year, filled with faith and symbolism leading up to Holy Week and the Resurrection. Last year I was in Beirut and participated in all the Passion Week ceremonies. I shall miss that. But I have been preparing and counting down the days to Easter with a Copt friend. This allowed me to learn more about the ancient Coptic people of Egypt and their rituals. 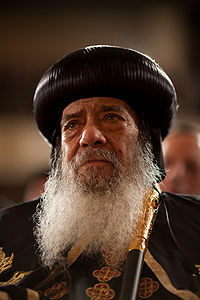 The 18 million Coptic community in Egypt, the UAE and worldwide began the Great Lent fast four weeks ago and have offered their prayers to Pope Shenouda, who is in poor health. The venerated Pope has been weak since back surgery a few years ago and members of his congregation are holding their breath for a sad announcement. Pope Shenouda III of Alexandria -- born Nazeer Gayed on August 3, 1923 in Asyut, Upper Egypt -- is the 117th Pope of Alexandria and the Patriarch of All Africa on the Holy Apostolic See of Saint Mark the Evangelist of the Coptic Orthodox Church of Alexandria. He is the head of The Holy Synod of the Coptic Orthodox Patriarchate of Alexandria. 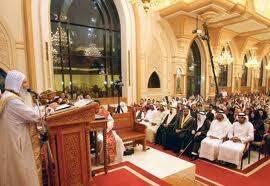 His Holiness was a guest in the UAE in April 2007, when he attended the inauguration ceremony of the new Cathedral of St. Anthony for Coptic Orthodox in Abu Dhabi -- a further expression of the Emirates’ openness and tolerance for religions. The Pope met then with UAE President Sheikh Khalifa bin Zayed bin Sultan Al Nahyan and religious officials. He presented a speech praising the UAE's religious tolerance policy and its role in enhancing co-existence between different faiths. There are several other Coptic Orthodox churches in the Emirates, including two in Dubai, Sharjah, Fujairah, Al Ain and one being built in Ras al-Khaimah. Pope Shenouda was enthroned on November 14, 1971, nearly nine months after the death of Pope Cyril VI of Alexandria. He presides over a worldwide expansion of the Coptic Orthodox Church. He is known for his commitment to ecumenism and has, since the 1970s, advocated inter-denominational Christian dialogue. 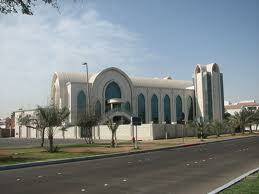 He devotes his writings, teachings and actions to spread and propagate understanding, peace, dialogue and forgiveness. No names have been made public on his eventual successor. The Coptic Orthodox Church of Alexandria is the largest Christian church in Egypt and the Middle East. Tradition has it that Saint Mark the apostle and evangelist established it in Alexandria in the middle of the 1st century, shortly after the ascension of Christ and during the reign of the Roman Emperor Claudius around 42 AD. By the beginning of the 3rd century AD, Christians constituted the majority of Egypt’s population, and the Church of Alexandria was recognized as one of Christendom's four Apostolic Sees, second only to Rome. The Church of Alexandria is thus the oldest Christian church in Africa. Of the 18 million Coptic Orthodox Christians in the world, between 10 and 14 million are Egyptian natives under the jurisdiction of the Coptic Orthodox Church of Alexandria. 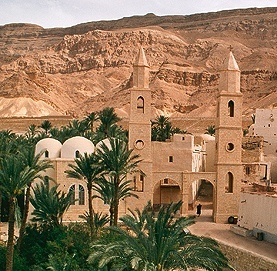 As a religious minority, the Copts are often victims of discrimination and acts of violence by religious bigots and extremists in modern day Egypt. 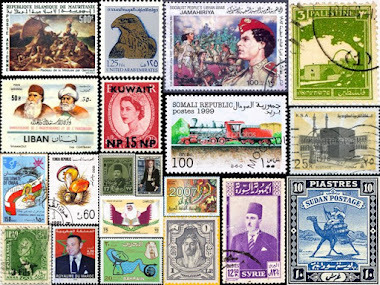 Being an integral part of Egypt's history, Christian Copts have shared and shined in all aspects of life in the country. The list of notable Egyptian Copts includes the sixth secretary-general of the United Nations Boutros-Boutros Ghali, the world's leading transplant surgeon Sir Magdi Yacoub, and world-renowned film directors Youssef Chahine and Henry Barakat. 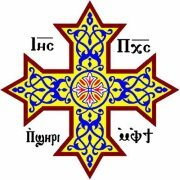 There are also significant numbers of Copts in the Diaspora in countries such as the U.S., Canada, Australia, France, Germany and Sudan. There are between 350,000 and 400,000 native African adherents in East, Central and South Africa. Although under the jurisdiction of the Coptic Orthodox Church, these adherents are not considered Copts, since they are not ethnic Egyptians. The Copts, I learned, have seasons of fasting like no other Christian community. They fast for over 210 days out of the 365 days in a calendar year. The diet then is mainly vegan, cooked with either oil or water. No animal products -- meat, poultry, fish, milk, eggs, butter, etc. -- are allowed. There are seven weeks during the year – between Easter and Pentecost -- where there is no fasting even on Wednesdays and Fridays. This is a period of joy for the community in celebration of the Resurrection of Christ. Lent, known as “the Great Fast,” is the main fast of the Copts. It consists of six weeks (40 days), which correspond to the 40 days Christ fasted on the mountain. It precedes Palm Sunday and Holy Week. There is an additional seven days of fasting before the beginning of the Great Lent, which serve as a preparatory period. Called "Pre-Lenten Fast" or "Preparatory Week," it is not part of the Great Lent fast. Sundays are excluded when counting these 40 days in that each Sunday is a celebration of the day of the week on which Christ rose and is a little Easter. The days of fasting are days of repentance and contrition. At the same time, they are periods of joy and cheer as believers experience victory and power in their innermost self through fasting, prayer and alms giving. The fast is very discreet. It is only through a change of routine in my friend’s lunch habits that I found out about her fasting and probed into it. It has been humbling to observe such personal faith and devotion. Personal in that it does not affect or try to affect others. It also led me to explore further into the writings and teachings of the revered Pope Shenouda, also known for his poetry and prose. Wishing all my fasting friends and readers acceptance of their Lent offerings and counting down to a joyous Easter. It’s March, the month when the international community marks International Woman’s Day (IWD) by virtue of the economic, political and social achievements of women. In the 21st century, with nearly half the world’s population of seven billion -- or 3,386,509,865 -- being female in figures published in 2009, one would have expected women issues and rights to become mainstream. Although we’ve come a long way since the first IWD event was run in 1911, there are still too many opportunities, injustices and inequalities to redress. In adopting its resolution on observing Women's Day in 1977, the General Assembly cited two reasons: (1) to recognize the fact that securing peace and social progress and the full enjoyment of human rights and fundamental freedoms require the active participation, equality and development of women, and (2) to recognize the contribution of women to the consolidation of international peace and security. 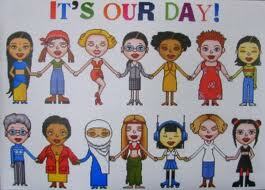 For the women of the world, the Day's symbolism has a wider meaning. It is an occasion to review how far they have come in their struggle for equality, peace and development. It is also an opportunity to unite, network and mobilize for meaningful change. On this year’s theme, the UN says: “Key contributors to global economies, rural women play a critical role in both developed and developing nations -- they enhance agricultural and rural development, improve food security and can help reduce poverty levels in their communities. In some parts of the world, women represent 70 percent of the agricultural workforce, comprising 43 percent of agricultural workers worldwide. “Estimates reveal that if women had the same access to productive resources as men, they could increase yields on their farms by 20-30 percent, lifting 100-150 million out of hunger. International Women’s Day, also under the slogan “Connecting Girls, Inspiring Futures,” hopes to include girls in some way and inspire minds globally. This led to a long discussion with friends one evening last week about how this inspiration and change will come through background, upbringing, family and most importantly education. I believe the first step on the long road to equal opportunities and development has to be through education. I remember an incident that marked me very early in my school years. I didn’t like studying much and preferred to be out in the school courtyard playing. I must have been around eight and my grades were getting worse with each end-of-month report card. One day, after another bad monthly performance, my mom Vicky decided that as long as I was not interested in studying and learning, she could do with someone to help her around the house. So in coordination with the convent I was then attending in Tunis, Tunisia, she took me out of school and had me work as a housemaid. This went on in earnest for three days. On the fourth, I begged to go back to school. The lesson was learnt and my grades picked up after that. Although mom Vicky has been gone for 20 years, thanks are always due to her for being the strong, intelligent and outspoken women that she was. She taught me to have a voice but to be tolerant, understanding and without prejudice. Mom had class, insight, wisdom, courage and humor -- in health and in sickness -- until her last hours. Vicky is still my reference for a great woman. For those of us women, who have had the privilege of an education and who are making their way through change and emancipation, let’s celebrate International Women’s Day by “educating forward” and inspiring a new generation. Let’s try and secure a bright, equal, safe and rewarding future for girls and women. And as always, let’s not forget to thank and celebrate the men in our lives who help realize these goals.